There is a common theme among leaders of oppressive regimes around the world — a rhetorical assertion that the United States is backing their opposition groups. While the theme may be tied to historical interventions conducted by the United States, it is currently being used in a systematic effort to undermine opposition groups. President Nicolas Maduro of Venezuela has recently employed this tactic, as his predecessor Hugo Chavez often did during his mandate. Earlier this month, on Youth Day a series of demonstrations began against the Venezuelan government because of skyrocketing inflation, rampant violent crime, widespread corruption, scarcity of basic goods, and the violation of human rights. These problems have been ongoing for some time, but recently they have worsened tremendously. Grocery stores have increasingly lacked groceries, and stopping at a red light has essentially become an existential threat. These protests, led by Maria Corina Machado, Leopoldo Lopez (who turned himself into the Venezuelan authorities on Feb. 18), and tens of thousands of Venezuelan students had the objective of being peaceful. And the protests were peaceful until the Venezuelan military, which is predominantly absent from controlling the insecurity of the country – one of the most violent in the world – was released to engage the protesters with high-caliber weapons and other excessive means. Currently, no one can leave the city of Caracas, which is essentially on lockdown. And the protests have spread across the country with cities like San Cristobal also reporting a similar lockdown. Maduro’s reaction to all of this has been to dismiss any wrongdoing on his part. Instead, he has accused the opposition groups of attempting a coup and inciting terrorism, expelled American diplomats, and blamed the United States for undermining his government. Regardless of the already strained relationship between the U.S. government and leaders such as Maduro, what Maduro should note is that mismanagement of a country cannot be blanketed by stereotypical accusations of American infiltration and terrorism. 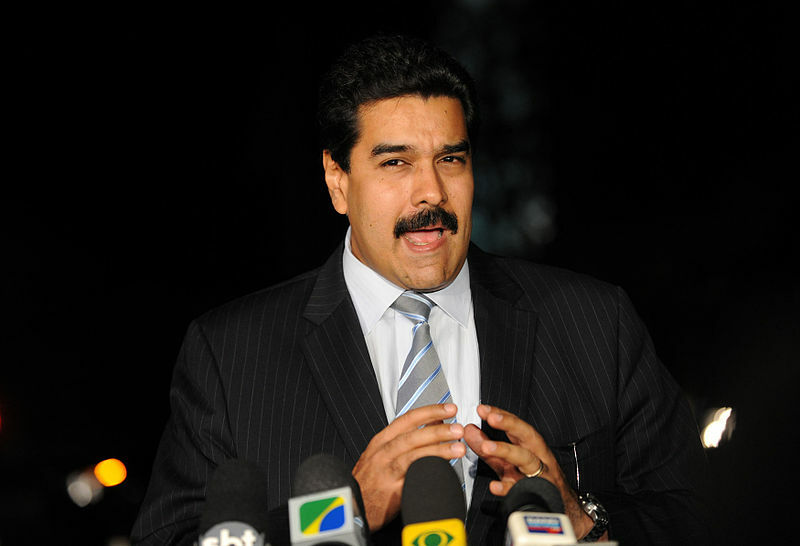 Maduro dismisses the reasons why his country has spiraled out of control and instead blames the big bad wolf. He has been somewhat successful at shutting off global communication in Venezuela, from newspapers to Twitter, yet he misses the mark on an overarching issue that should be simple politics. That is, if a government cannot manage its people, that government will one day be replaced regardless of its attempts to silence those who speak out against it (his predecessors can attest to this). Unfortunately for Maduro, the simplicity of this seems to be so complicated that his admissions of the problem are nonexistent. Solutions to rectify the downward spiral that is Venezuela will not be made, because as the saying goes, one cannot fix the problem until one is willing to admit that there is a problem. The United States will continue to be the scapegoat for the leaders of these countries, such as Venezuela, and in turn, these countries will be destined for a future of violence and poverty. Of course, this is not because the United States is causing such violence and poverty, but, rather, the countries who are quick to point the finger cannot accept that they alone caused their demise. Socialism in particular will take a big hit in Venezuela, and it will be noted through the impossibility of even disbursement of goods always held by the top elite. In the end, Maduro should be careful. He should not underestimate the power of a revolution of dissatisfied peoples. It was Chavez’s small group that led to him being put in power. And while he may have imperialistically taken the throne, it is inevitable that he will lose the country the same way Chavez took control of it. We have faith in Venezuela that it can bring itself together. Educated citizens who have global communication at their fingertips will continue to speak out against their government. It may take some time, but when the current system is replaced with one that doesn’t ruin one of the most resource-rich countries in the world, then there is hope for the Venezuelan people.